Every day of our lives our body requires a combination of many nutrients in order to function properly and stay alive. These nutrients include the main macro-nutrients: proteins, carbohydrates, and dietary fats along with micro-nutrients such as vitamins and minerals. Most people can get the majority of their nutritional needs by paying attention to their diets. However, how do those that have adopted a low calorie crash diet (thinking that is the key to get them to their desired weight quickly), expect to fulfill these nutritional requirements? Truth is, crash diets are a set up for serious nutritional deficiencies. And, while some supplements can help to prevent certain nutritional deficiencies they will never be as effective as those from Mother Nature herself and the foods consumed. In addition, when counting on supplements to fill the void, you will be missing out on other important things that food provides us, such as fiber. What good is it to get to your desired weight by using extreme measures if in the end they only cause a greater risk of long term health problems that can possibly impact you for years down the road? It’s simply not a good trade-off. Is dropping 5 pounds within one week really worth risking damage to your health? You know the answer to that. Nothing is worth sacrificing your health over. Eliminating or avoiding certain healthy foods in order to reach a certain weight quickly or opting for low grade foods is like putting low grade fuel into your car or no fuel at all and expecting it to run at peak performance. Your car cannot run and work properly without good fuel and neither can your body. The most detrimental issue you will suffer from when adopting a crash diet is setting yourself up to lose lean muscle mass. Muscle is highly metabolically active – it’s muscle mass that strokes your metabolic engine. Low calorie diets significantly slow down your metabolic rate because your body is not interested in getting skinny (that’s something that your mind is attached to)…its focus is staying alive and healthy. Losing muscle mass makes maintaining weight loss harder down the road because the more muscle mass you have the more calories you burn on a day to day basis. If there is one tissue that you absolutely do not want to lose…it’s your lean muscle mass. The more muscle mass lost, the less firm and fit you’ll look, eventually leading to “skinny fat” syndrome. You may look thin but your body composition is far less than ideal, sporting a higher amount of fat mass but a very low amount of muscle mass. Your body is smart, give it a little credit. When it senses that there is a shortage of fuel coming, it will immediately begin the process of conserving the fuel that is already there. So, rather than burn 1400 calories in order to maintain basic life functions (just keeping your body running) it slows things down, eliminating what’s not absolutely needed for survival, so that you are now burning only 1100 calories in order to keep you alive. The problem is, now you have to consume 300 fewer calories each day just to maintain your weight, never mind experiencing any weight loss. As your body starts slowing your metabolic rate down other processes that are not necessary for survival start to shut down as well. Reproduction is an energy drain that you don’t need so it suffers. Your libido levels plummet as well. And that’s just the short list. How do you expect to experience optimal health if your natural body functions are shutting down? Finally, low calorie diets turn into a hormonal nightmares as they impact nearly every hormone in the body from serotonin which is our “feel happy, mood happy” hormone to testosterone which improves our ability to stay lean and keeps our sexual drive where it needs to be. And serotonin is not the only hormone negatively affected. Insulin, cortisol and ghrelin (among others) are all effected by these crash diet tactics. Since hormones are master controllers of every function in our bodies – they literally effect emotional, mental and physical health. Is it really worth the short term risk to mess with them? Low calorie crash diets are not only dangerous to your health, they are nearly impossible to stick with. Trying to stay satisfied and fend off hunger is virtually mission impossible when your body screams at you to give in. No one is determined enough to combat the defenses of their body when it is crying out for food. When it wants to eat badly enough…you will be eating before long. When you do finally give in, it will likely be the first thing that is within your reach and in most cases, it won’t be something that contributes to your health. Give up counting calories along with extreme, crash diets. 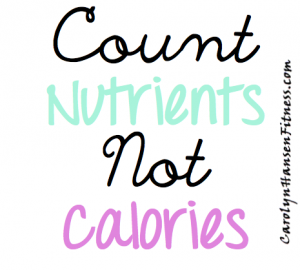 Counting calories is not the answer. Counting nutrients is.